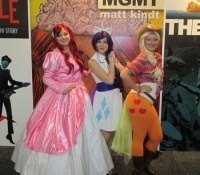 We concluded our Comic-Con photo series with Part 9, last month, but found a missed sequence from Sunday. Go back to Part 1 to start at the beginning, or to Part 5, to check out Saturday. 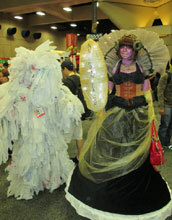 Cosplayers, hanging by the Dark Horse booth. 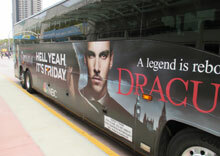 An NBC Fridays bus, flogging Grimm and Dracula. Mystique and a sparkly person, still smiling on Sunday. Looking for a light, on the way in. 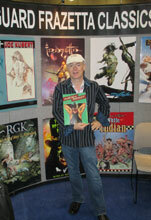 Vanguard’s David Spurlock with his company’s excellent The Alluring Art of Margaret Brundage, collecting the art and telling the story of the “Queen of the Pulps”--one of the summer releases we liked best. Promoting Aliens in LA, "a collaborative project between photographer Christopher Nelson and artist Treiops Treyfid shot on the mean streets of Los Angeles," a Comic-Con exhibitor. A dark cloud was cast as the Witch-king of Angmar (the Lord of the Nazgûl) appeared… where is Elrond when we need him? !